In the ideal aerospace job shop, creating a first article inspection report (FAIR) would be simple. The requisites of the aerospace standard AS9102, “First Article Inspection Requirements” would flow through one system where all stakeholders could manage data instead of pushing paper around the supply chain. Reality is far different and heavily dependent on paper, but that situation is changing. My employer, TECT Corp., is one of the largest nonoriginal equipment manufacturers of static and rotating aerospace components and assemblies. Its plant in Newington, Connecticut, produces flight-critical turbine hubs and rotors, up to about 60 inches in diameter, for use in aircraft, ships, pumps, and power generation. Several months ago, we decided to create electronic AS9102 FAIRs. We selected DISCUS, an FAI acceleration software from Characteristic Solutions Co., and purchased multiple licenses through Renaissance Services in Springfield, Ohio, which provides systems integration services and several quality management tools, such as statistical process control, document management, and middleware. DISCUS is a tool for rapidly annotating (ballooning) tagged-image file format (TIFF) and portable document format (PDF) documents to create AS9102 forms in Microsoft Excel and fully annotated PDF documents. The process of ballooning (or annotating) a drawing or specification into an AS9102 form is intuitive due to simple menu-driven commands such as “Add Drawing.” I was able to start ballooning within a few minutes of installing the software. A variety of resources for DISCUS are available through its Web site, including manuals and a service-request form that results in a prompt reply via e-mail or phone call. DISCUS opens with four panels: drawing/model, specification/design, requirement-image, and requirement- structured. The latter two panels form the bill of characteristics (BOC). 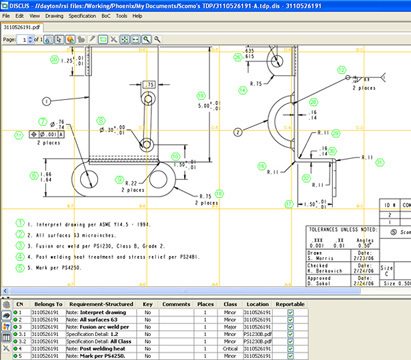 The drawing and specifications panels contain the input documents (these must be TIFF or PDF files). Each time a balloon is placed on an image in the drawing panel, the Excel-like requirement-structured panel is automatically populated with the next sequential balloon number. The user then clicks on the balloon or on the characteristic in the BOC panel to enter the requirements using predefined pull-down lists and dialog boxes for characteristic type, tolerances, number of places, etc. Completing the BOC changes it from incomplete to complete, and changes the balloon color from red to green, providing a visual flag that the requirement is complete. The self-checking features of the software ensure that all criteria must be satisfied before a characteristic’s status changes. The user continues to balloon the drawing until all characteristics have been identified. Each item in the requirement-structured panel can have an associated image in the requirement-image panel. Drawing a lasso around a portion of the specification or drawing will cause that part of the drawing or spec to appear as an image in the requirement-image pane. Clicking a characteristic number in the BOC highlights the balloon on the drawing for easy identification. Two handy features of DISCUS are the abilities to create multiple levels of sub- balloons and to overlay a coordinate grid. When the overlay grid is dropped on a drawing, the BOC is automatically updated . The fully ballooned file is delivered to users by exporting native DISCUS files in two parts: BOC data and annotated PDF documents. For another error-prevention measure, exporting is disabled until all characteristics have been completed. The BOC can be exported to a statistical process control program, such as NetInspect, or to Microsoft Excel via the built-in default template that DISCUS uses for AS9102. Users can also easily build their own Excel output formats using simple tokens. The ability to reuse data allows me to adapt information to match my own needs. I have customers all over the world; some use metric dimensions, others use English dimensions, and some use a combination of both, which DISCUS can accommodate. When we use subtier suppliers, DISCUS allows me to create custom filters based on a keyword and to export just those characteristics for which the vendor is responsible. DISCUS has a few quirks and shortcomings that may not be noticed by many users. First, creating a FAIR for, say, 50 one-page drawing files causes some file names to be hidden in certain menus. Second, an auto-save function would be useful. Third, it would be nice to be able to create balloons prefixed with user-defined text. DISCUS is routinely updated, so these features may be added in future releases. Regardless of minor issues, I recommend DISCUS for job shops, even nonaerospace shops, where dimensional traceability is required. Harold J. Crossman is a senior quality assurance engineer at TECT Corp. Since 1979, Crossman has held various positions in manufacturing, failure analysis, and quality assurance for aerospace, defense, automotive, and refractory metals industries.